WASHINGTON -- The most extreme tornado outbreaks are mysteriously spawning many more twisters than they did decades ago, a new study claimed. The once-every-five-years-or-so outbreak that might have involved 12 tornadoes 50 years ago now has on average about 20, said Columbia University applied physics professor Michael Tippett, lead author of the study in Thursday’s journal Science . The study comes in the end of a year that has been on track to have the fewest tornadoes on record, but is also on the heels of the outbreak Tuesday night and Wednesday morning that killed five people and injured at least 46 in Alabama and Tennessee - precisely the kind of outbreak Tippett studied. As of now, there were 36 tornado reports Tuesday in Alabama, Tennessee, Mississippi and Louisiana, half of them were the stronger type Tippett studied, said meteorologist Patrick Marsh of the National Weather Service’s Storm Prediction Center in Norman, Oklahoma. 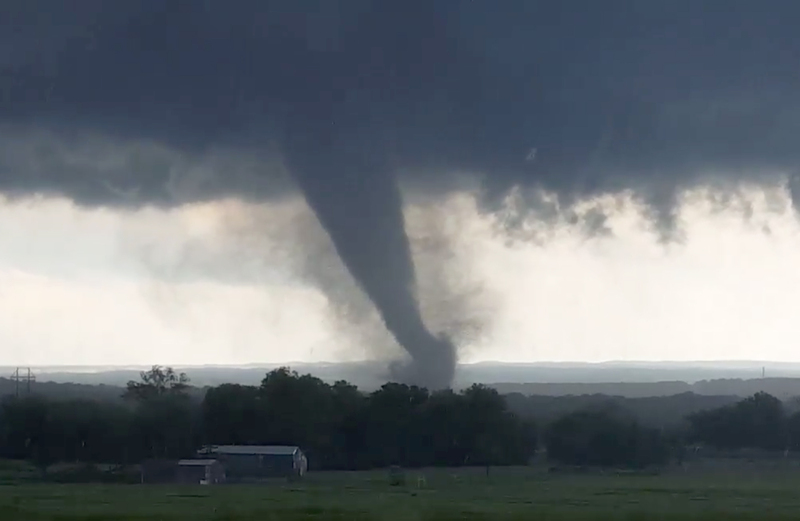 Tippett and colleagues looked at just the most extreme outbreaks and tornadoes that are above the minimal wind rating and found a steady uptick in the biggest outbreaks since the mid-1960s. Marsh said until Tuesday’s outbreak, there had been 830 tornadoes all year , which was below the previous low for that date of 920. The normal number through late November is closer to 1,300. While 2011 was one of the busiest tornado years for the size of twisters that Tippett studied, 2012 was one of the quietest, he said. Unlike other spikes of extreme weather in recent years, Tippett and colleagues could not find the fingerprints of man-made global warming in the change. Eight outside experts were split about whether the study made sense. “This is really important step forward in the detection in the change of frequency of occurrence of these events,” Stanford University professor Noah Diffenbaugh said. But some of the other scientists said improved reporting and urban sprawl increases the number of recent tornadoes and negates some of the trend Tippett found. They also disagree with the particular type of measurements that Tippett used and some of his definitions.